There are many waves on the surface of the ocean. As you stand on the shore and divert your gaze from the phenomenal, changeful, colorful relativity, you will see only that sameness, vastness, just water. That is the unifying factor: water. Waves play upon the water but water is changeless. Absolute becomes relativity, and in the same way, God became all this.. 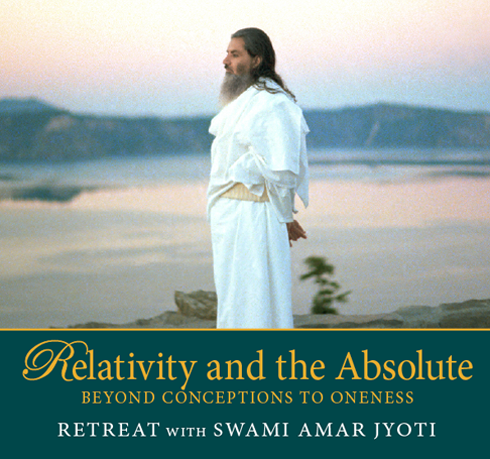 In this retreat, given by Swami Amar Jyoti in 1979 in Ortonville, Michigan, He explores relativity and the Absolute. There is a basic fallacy, He reveals, that makes us slip from the Truth. He gives guidance on how to remain in the stillness between two points of relativity. We have to go beyond conceptions and the delusion of perception to realize Oneness, the Source. Sages call this by many names: Samadhi, Christ Consciousness, Nirvana. By choosing our own path we can see from the pinnacle of the cosmos. Gurudeva also explains how attachment produces injustice and fragmentation. Purification, our sweet will, faith and devotion are needed to unfold. Only by breaking the barriers of our limited consciousness are we resurrected to the Pure Light. 5 What is the Purpose of Life?